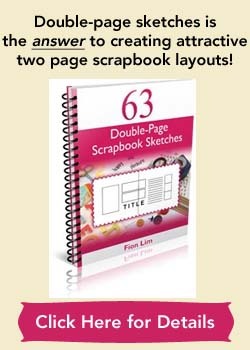 This scrapbooking idea is a fun one, to show off your current favorite fashion! Are you a fashionista flaunting the latest outfits that grace the magazine pages? Are you into classic and elegant clothes that never really go out of style? Or are you the laid-back casual woman who’s a true fan of jeans, denim and tank tops? Go pick out a few photos that reveal your state of dress sense. I understand fashion comes and goes fast, so creating a page on what you’re wearing these days would be an interesting page to review in time to come. It’s a representation of you in the image department. As you look at your page in future, you might think, “You mean I actually wore that?! !”, “See how my style never did go out of fashion and now it’s back in fashion again”, “Aargh, I wish I would dress a little different than what’s showing here!”, etc. See what I mean? Having a page like this serves as a time capsule to your then dressing style, and how much it remains the same or differs from your future dressing style. 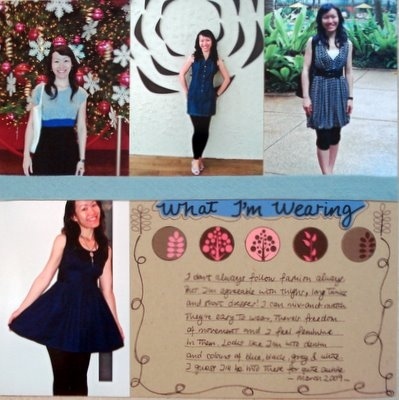 Supplies used: Tan cardstock – Bazzill Basics; Blue cardstock: Worldwin; Circle images – Digital collage (unknown); Baby blue felt – Daiso Japan; Black Marker – Zig Memory System “Dotta-Riffic”; Black pen – Zig Memory System “Millennium”; Circle punch – Carla Carl Craft; Sketch: No. 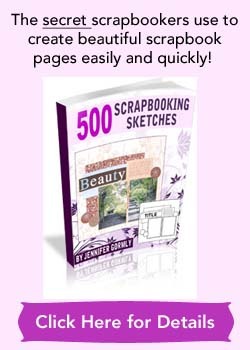 376 from 500 Scrapbooking Sketches.